The Ripponden hotels listed below are either in the town or we have given a rough guide as to how far they are from Ripponden. We hope you enjoy your stay and find your ideal accommodation. 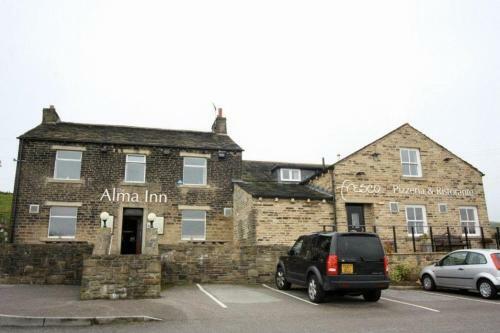 The Alma Inn is a luxurious hotel set in a 150 year-old building. It boasts an Italian restaurant, a lounge bar and a large patio. All bedrooms are en suite. All the rooms have tea/coffee making facilities and some of them have views across the Ryburn Valley. Fresco's Italian restaurant and Pizzeria at The Alma Inn serves dishes made with local produce and it has its own wood burning pizza oven. The hotel offers free parking and free Wi-Fi to all guests. Location: about 1 mile from Ripponden. For hotels accommodation in other areas nearby see Huddersfield hotels & Halifax hotels.